Have you ever worked with an inexperienced HVAC company or individual who didn’t get the job done the way he or she was supposed to? We’ve all been in situations like this where we feel like we’ve been scammed and the technician isn’t willing to fix the issue they caused (or never fixed in the first place). Oftentimes, these HVAC technicians are simply inexperienced and don’t know how to handle a situation where they’re in the wrong. In this blog, we’re going to talk about some of the top reasons you should hire an experienced HVAC technician to work on your air conditioning or furnace here in New Jersey. 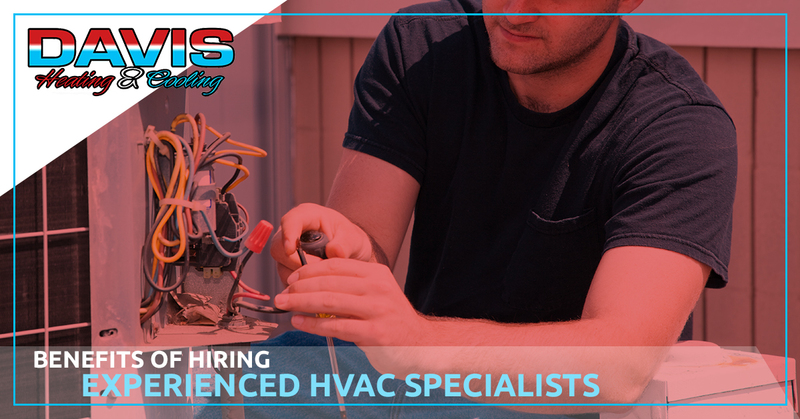 If you decided it’s time to speak with a reliable HVAC company, don’t hesitate to contact Davis Heating & Cooling. We’re always ready to help! When it comes to maintaining your home’s HVAC system, the knowledge of your HVAC technician means the difference between a system that functions correctly and saves you money and a system that is downright broken and causes your energy bills to skyrocket each month. With experience comes a comprehensive knowledge of all things HVAC. And when you’ve been working in the industry as many years as we have here at Davis Heating & Cooling, you start to notice patterns about what could potentially cause a system to break down or function inefficiently. It’s our highest priority to not only provide you with the services you asked for whether it’s a simple repair or entire system replacement, but to also take it upon ourselves to locate any potential issues with your system and fix them so that you’re not left with a poorly functioning system once we leave. Another thing that comes along with experience in the HVAC industry is a good reputation and the reviews to show it. An experienced and reputable HVAC company won’t be afraid to show off what people are saying about them. You can see our testimonials here at Davis Heating & Cooling by visiting this link. You don’t just need an HVAC company who has the knowhow to get the job done correctly, you need a company that guarantees your satisfaction. At Davis Heating & Cooling, all new heating and cooling equipment and systems installed by us are covered for the first year of operation by our Standard Davis Care™ plan. Standard Davis Care™ includes priority scheduling in the event of an equipment breakdown, No out of pocket expenses for the first year and the first annual maintenance inspection of the new equipment or system included at no charge. These are just a few of the main reasons to trust an experienced HVAC company with all your heating and cooling needs. We have over 30 years of experience in the heating ventilation and air conditioning field and have proven time and time again that we don’t just meet our clients’ standards, we far exceed them! Give us a call today or visit us online to learn more about what we offer.